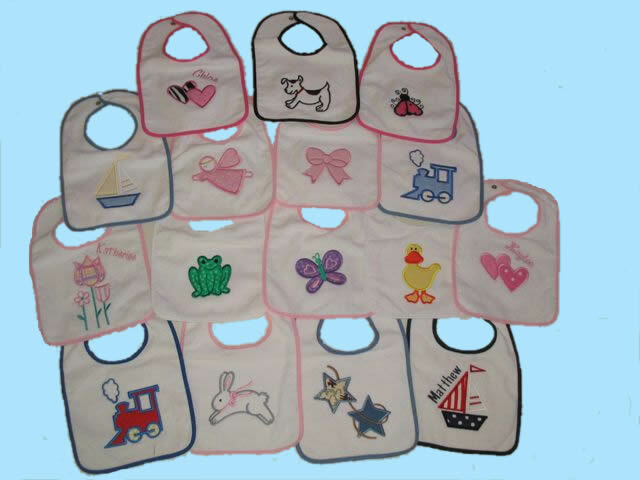 Our bibs are white, 100% cotton terry cloth with colored piping and snap closure. These are the perfect sized bib to last throughout your baby’s bib wearing days. They are a super bib to roll up in your diaper bag and have on hand for eating out and looking great. They are also perfect for your little drooler over our appliquéd rompers of the matching design. Buy packaged with a matching burp cloth for a darling gift idea. Be sure to get a custom monogram for the perfect personalized gift idea.